​Steve McCarthy couldn't believe what he was hearing when he was told that two goats were trapped on a bridge beam in Lawrence County. It took photographic evidence for McCarthy, senior civil engineer for PennDOT's Pittsburgh-area district's bridge unit, to be convinced. In an effort to rescue the goats, Dave Lancaster, assistant highway maintenance manager, requested McCarthy's assistance with a snooper truck. Unfortunately, both the Pennsylvania Turnpike Commission and District 11 did not have the equipment readily available. Fortunately, Tim Wilson, crane inspection supervisor, and Steve Cochran, bridge inspection crane technician, both from PennDOT's Indiana-based district, saved the day when they arrived with their district's snooper truck. McCarthy had initially planned to grab the goat facing the wrong direction, turn it around on the beam, and allow it to walk off on its own. However, when the crew approached to the beam, the goats started walking away from the bucket. With both goats facing each other and only one direction off the bridge, McCarthy decided to guide the goats toward a stiffener at the pier where they couldn't move around. "I'm going for it!" were McCarthy's words to Wilson, who was also in the bucket. "I was also thinking this could be detrimental to my career if I were to drop this goat while everyone is videotaping," McCarthy said. He then reached in and grabbed the white goat and successfully brought it into the bucket. There wasn't enough room to put the goat on the floor, so Wilson lifted the bucket to the bridge deck where McCarthy handed off the goat to its owner. Upon returning to the beam, McCarthy and Wilson tapped on the flange to get the remaining goat, who was facing toward the end of the bridge, to walk off on its own. "I have been involved in some crazy stuff in my 19 years at PennDOT," McCarthy said. "This has to be the craziest." The story went viral, hitting national outlets USA Today, NPR, CNN, Fox News, CBS, and The Weather Channel. The goats even received international attention through coverage by the Independent in Ireland and the Daily Mail in the United Kingdom. McCarthy joked that he wants Brad Pitt to play his role in what is sure to be a summer blockbuster. 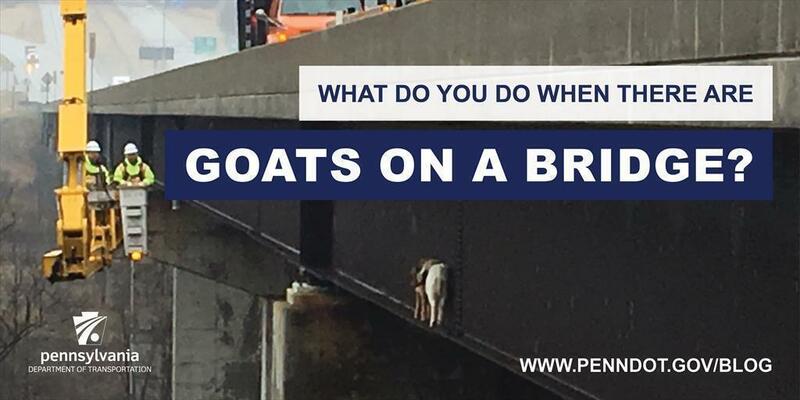 PennDOT and the Turnpike Commission were given a Compassionate Action Award by PETA for their efforts in rescuing two goats stuck on a bridge in Lawrence County. Though the story seems lighthearted, McCarthy and company had one chance to get it right under unusual and stressful circumstances. The team handled themselves professionally and were successful in safely returning the goats to their owner. In fact, PETA presented PennDOT and the Turnpike with the Compassionate Action Award. The award cites "May this act of compassion serve as an example for others to emulate."